While it's true that if it's the world of "rock criticism" that we are talking about, the concept of "notoriety" is a nebulous one, the case of Ian MacDonald is quite peculiar. On one hand, though he's had a long career - Assistant Editor for the New Musical Express during the years 1972-1975, then as a highly esteemed freelancer for a series of high-profile magazines - his name is not the first one that comes to mind if we talk about rock critics from UK, that honour probably going to historical figures such as Nick Kent, Charles Shaar Murray and Simon Frith or to later figures such as David Toop and Simon Reynolds. On the other, the book titled Revolution In The Head - The Beatles' Records And The Sixties (originally published in 1994, revised in 1997) is unanimously considered - and rightly so - as a peak in the study of the music of the Quartet from Liverpool - and of "popular music" in general. And Ian MacDonald is the author of that book. Its success is due to critical co-ordinates that would be considered noteworthy even when present singularly but which are just short of prodigious when appearing all together in the same work, i.e. : an accurate musicological study of the compositions (obviously including the complex and innovative studio work); the personal lives of the main characters and their relationships to the songs; the general musical framework (and its relationship to the music of The Beatles); the socio-political framework in which the music took place and which this music influenced. The whole book brims with acute observations, but it's the long Introduction and the Note to the Chronology that appears at the end that paint a picture of such richness and originality that has few equals. A very favourable review that recently appeared in the pages of The Guardian alerted me about the existence of The People's Music: a collection of writings - articles, profiles, album reviews - of variable length that have already appeared in magazines such as Uncut, Mojo and Arena. "Who is the perfect reader for this book?" is a question that's usually asked at the end of a book review, but this time it's better if we ponder the topic right now. All the artists profiled here are pretty diverse when it comes to language, style, notoriety, relevance and financial fortunes, but they all have something in common: the best and most innovative part of their work happened in the past. So I'll immediately say two things. First, Ian MacDonald's reflections are always in the "present tense"; this can seem quite banal if we don't consider the fact that quite a few of those critics "who were there" when dealing with the past retell the same things (sometimes even using the same words!) from their long-gone youth, with quite comical effects. Then, whatever the reasons for this (discussing this point would take me too far, but in the book some clever hypothesis are formulated), it's been demonstrated with very slim uncertainty margins that the fascination for the artists of the "classic" period is by no means limited to those who are old (and those who doubt this fact should take the time to check those who buy those albums and the magazines that put those artists on their covers); so it's crucial that the meaning and (very important!) the context - which is obviously absent from the records themselves - are discussed by those who are able to elaborate on those aspects for us. Situated at the beginning and at the end of the book, the two long essays dedicated to Bob Dylan and Nick Drake could be considered - in theory - not too promising, the former artist having been the object of too much attention since time immemorial, the latter having been the focus of too much attention in a relatively short time; but Ian MacDonald brilliantly succeeds in giving us information, perspective and a very personal interpretation. All the other writings present points of interest and can sometimes be quite surprising - see MacDonald's opinions of Marvin Gaye's personality and of his recorded work. The Beatles are featured with regards to John and Paul writing partnership and to their famous psychedelic period - Love and Drugs; and there's also a portrait of America's John: The Radical Lennon, about the John Lennon Anthology; while their old rivals, The Rolling Stones, appear in their Sixties guises. Among the other stuff, MacDonald perceptively re-examines Chic; Gaucho, the last recorded chapter of classic-period Steely Dan (it's unusual seeing a rock critic compare the original vinyl with TWO different CD versions! ); the recently "rediscovered" Forever Changes by Love; the Beach Boys; David Bowie's "coke-mystic" period; obviously there's Hendrix; less obviously there's Laura Nyro; also featured are Spirit and The Band's Music From Big Pink. Some bashing that hurt me: Cream and Jefferson Airplane. There is also an acute analysis of Miles Davis's Filles De Kilimanjaro, an original perspective on minimalism, and Pulse Of The Machine, a decidedly against-the-grain piece about the consequences of automation in music. The brief Introduction to the book offers some caveats, my favourite being the one that goes: "One aspect of this book which is undeniable is its view that the best popular music done in the period under consideration was made during the sixties, when rock was at its peak both as a new, half invented art form and as a receptacle for rebellious social impulses." (page viii). This is an assertion which will obviously be reason enough for some to abandon reading this book. But things are not so simple (with the exception of those who have to sell the "records of the day" or risk bankruptcy, or those who still ask what The Rolling Stones really did, besides rediscovering the blues). 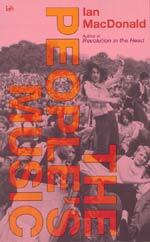 The People's Music - the excellent essay which gives the book its title - gives us a key to the other pieces and is in a way the background to all that's mentioned in the book but is also present by way of implication, while some trends which are situated at a "macro" level give us a satisfactory explanation of some aesthetical factors - see for instance the ever-increasing part reserved today to irony and nostalgia - in ways that are a lot more convincing than simple "matters of taste".